“Our organic Shea Body Souffle differs from the many shea butter products available to consumers because we use all natural, unrefined African shea butter with certified organic coconut oil, which is rich in essential fatty acids and vitamins and help heal and nourish the skin,” states Enessa Skincare founder Michelle Ornstein. “This unrefined Shea butter is manufactured under fair trade and organic guidelines. This means it is not extracted using hexane or other chemicals, bleached, or deodorized, and we do not add preservatives, yellow coloring agents–natural or artificial–or other additives. We bring it to you fresh in its purest and most natural state, which is why it has a beigish, light brown color.” The shea nuts come from wild shea trees over a vast area in central and northern Togo, a West African country located between Ghana and Benin, where cooperative members use centuries old extraction techniques to produce this truly exceptional quality shea butter. Other ingredients in this delicious body moisturizer include: Vitamin E and organic red palm oil, which together render the smooth velvety texture, helping to regenerate the skin; and a refreshing citrus blend of mandarin, petitgrain, and litsea cubeba essential oils, which calm and sooth the skin, while invigorating the senses. Available in a 3 oz. Jar, the product retails for $35.50 online at www.enessa.com . 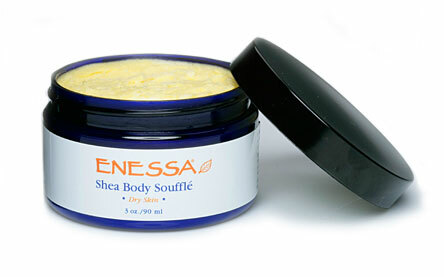 A similar version of this Shea Body Souffle is available specifically for babies. It can also be ordered via toll-free number at (888) 4-ENESSA. The complete Enessa skincare line includes facial cleansers, organic hydrosols, organic facial nourishments, seaweed nourishing gels, exfoliant and facial masks, anti-aging products and special treatments.